New York City’s largest hands-on spring cleaning event, New York Cares Day Spring, joins together more than 4,000 volunteers to revitalize 74 parks and community gardens. This year, Madison International Realty sent a group of its employees to the International Rescue Committee’s New Roots Community farm in the Bronx. In just three hours, the team was able to dismantle six planter beds, construct five new planter beds, and helped remove weeds and an irrigation system from the one acre land. Since 1933, the International Rescue Committee (IRC) has been the leading non-sectarian refugee relief and resettlement organization in the United States. Its New York office resettles refugees and victims of oppression in the New York City area. Its New Roots Community Farm program enables refugee farmers to revitalize urban spaces, share their homegrown crops at farmers markets and rebuild local food systems. 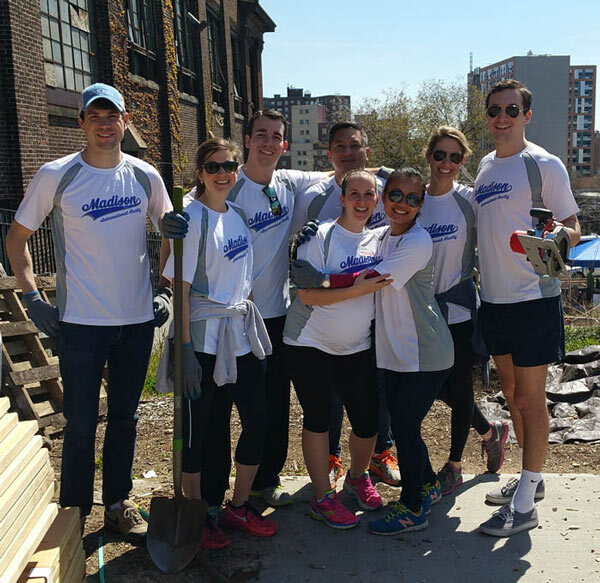 This is the second year Madison International Realty has participated in New York Cares Day Spring. The company continues to prove that is dedicated to serving the needs of our communities by combining the resources of the company with the energy of our employees.